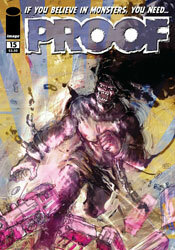 Proof follows the adventures of a government-employed Sasquatch, John "Proof" Prufrock, as he hunts mythological beasts and unknown monsters around the globe. What better agent for that line of work than Bigfoot himself, right? Paired with a young agent named Ginger Brown, the Sculley to his Mulder, Proof has already run into El Chupacabra, The Kraken, The Loch Ness Monster and a living, breathing pack of dinosaurs. So why is he convinced he's hallucinating when he randomly bumps elbows with the Savage Dragon? Nevertheless, Proof doesn't bother itself with such details. The name of the game is imagination, in excess, mixed with a heaping helping of adventure and a splash of action. While this issue does have an awful lot going on from time to time and a cast that's nearly large enough to fill a football team, (long snapper and all) I didn't find it confusing or unwieldy. The narrative jumps around a lot, with little regard paid to smooth transitions, but it's still understandable. Grecian's craft needs a lot of work, but his ideas are so original, so numerous, that many of his sins are forgivable. I look forward to the day this writer can combine his overactive imagination with a stronger grasp of good storytelling. I had a lot of trouble adapting to Riley Rossmo's manic, scatterbrained artwork. His style is so loose and playful that at times it felt like I'd been browsing the artist's sketchbook, rather than his contributions to the finished page. His camera often dips and sways drunkenly, which left me disoriented and almost motion sick, like I was reading this issue aboard one of those ships from Deadliest Catch. It's not that Rossmo's artwork isn't without its merits; the energy of his work jumps right off the page, he's keyed in to the silly, lively vibe embraced by the storyline, and he's nothing if not original. Nothing else on the shelves today looks quite like this, it's as if Bill Plympton, Sam Kieth and Peter Chung were thrown into the same jar and shoved in a high-velocity paint mixer. So Rossmo deserves high marks for originality, but the craziness of his work demands all of the reader's attention when it should be splitting time with the story. This is a series that appears to be in the midst of a shared set of growing pains. Both Alex Grecian and Riley Rossmo have the skills to really make some waves in the industry, but both are so raw and unbridled at this point that they're flying way, way under the radar. As a straight-up mind dump, Proof is second to none. It's playing with ideas and concepts that many creators can only dream about, and moving at such a breakneck pace that I can't imagine how it's survived for fifteen issues. As a coherent narrative, however, it struggles. Flip through it to enjoy the positives, but pause to consider the negatives before you take it home.